Despite the Knight Errant not being complete, I decided to pull out his colleague and get a group shot. I distressed the shield with white spirits by accident, so a bit more battle damage than expected! 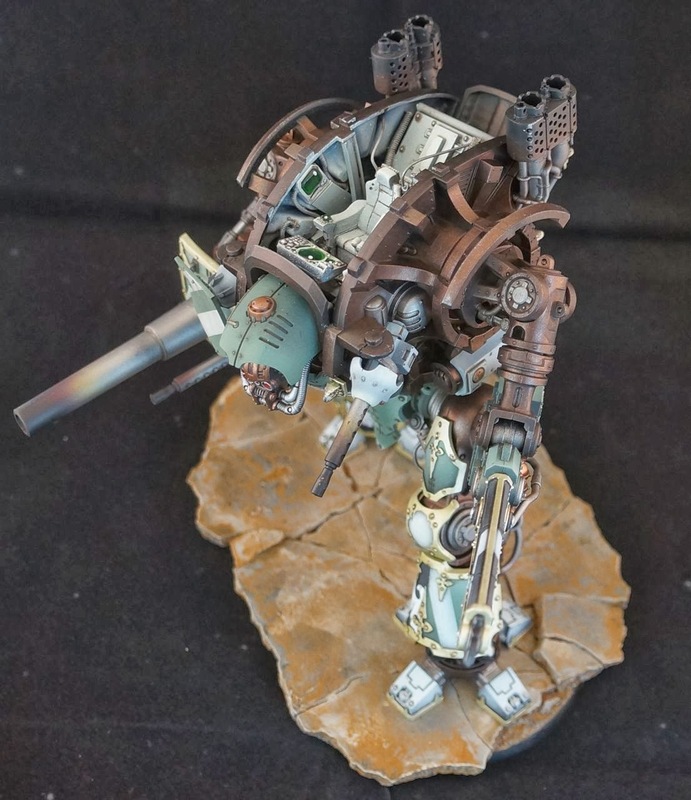 I'll break out the photo booth and take some better photos when the knight is completed. So as you can see, I decided against chevron's and instead went with black and white stripes on the middle of the carapace. 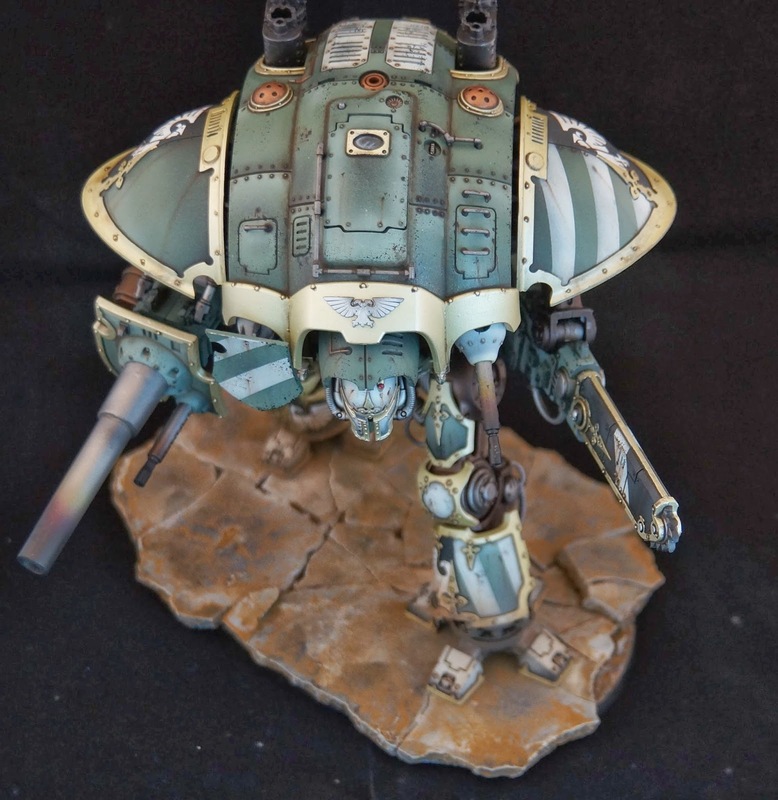 This leaves me in a lot of options for the last knight in the formation. 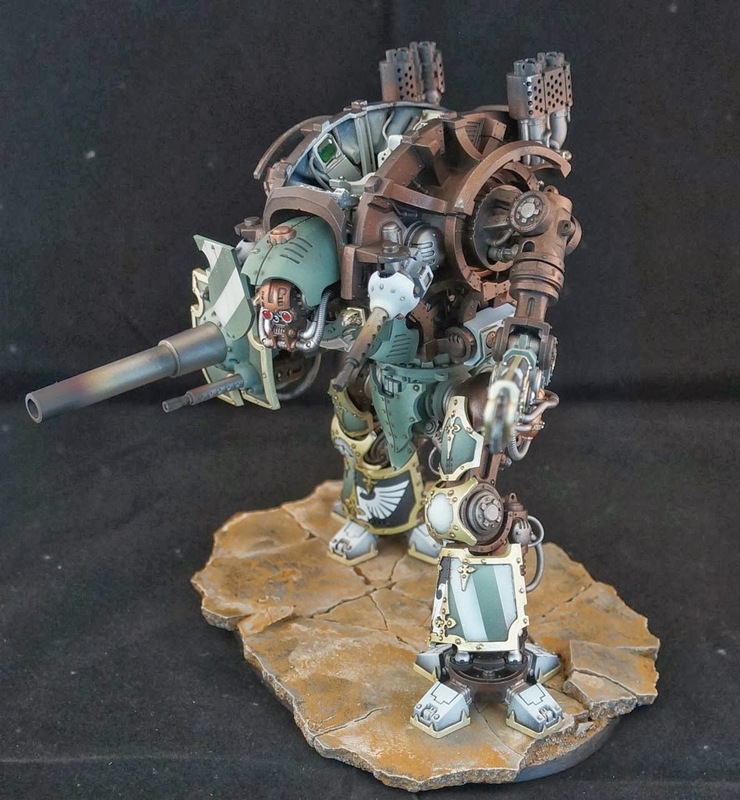 One thing is certain though, the last knight needs to have his legs reposed. I chickened out on reposing the legs with this one, but I just won't look good if they are all striking the same pose. 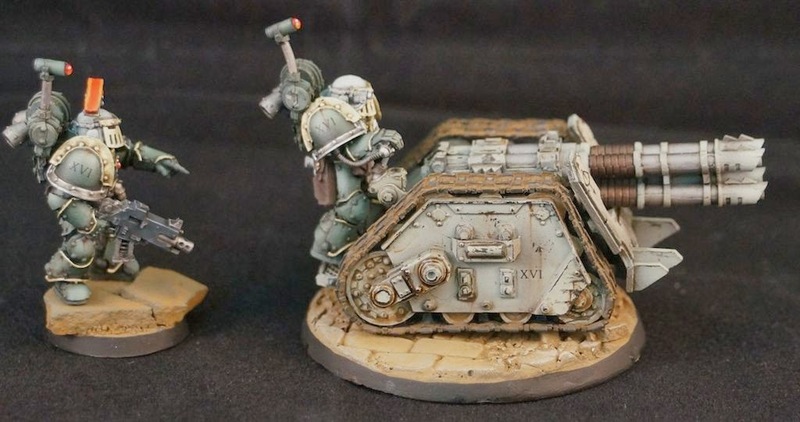 Plus, I really need a way to work in some Emperor's Children purple on the base. 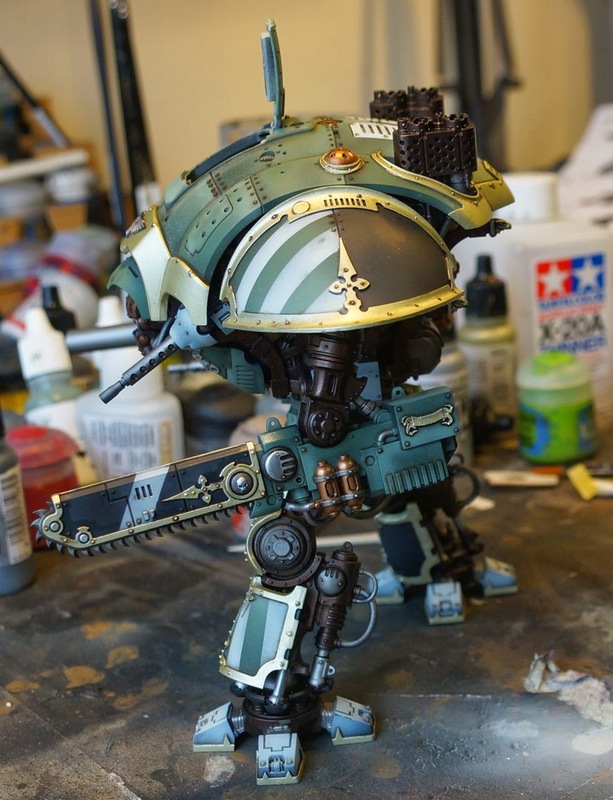 I got a little ahead of myself last week and went ahead and made this knights base first. 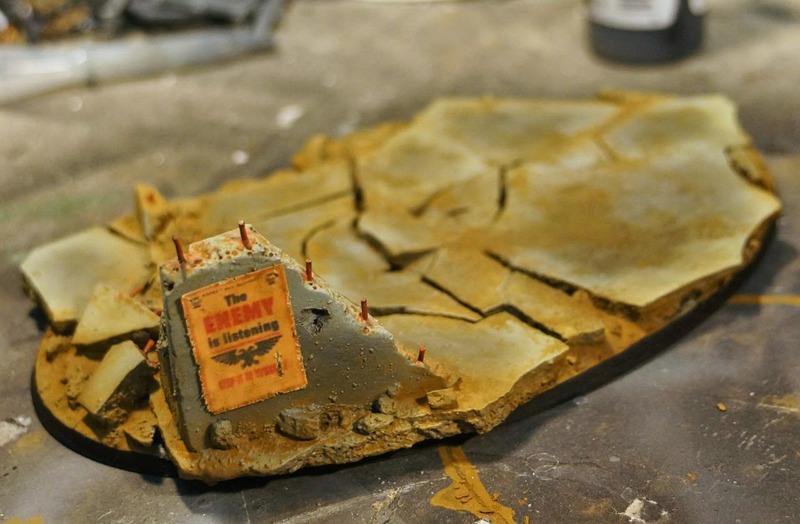 I couldn't resist making a base that had a ruined building and propaganda posters on it that I had start painting from the ground up. If you could see my browser cache you'd see that I found a neat little tutorial on making to scale crushed beer cans. expect to see litter on these bases in coming days. 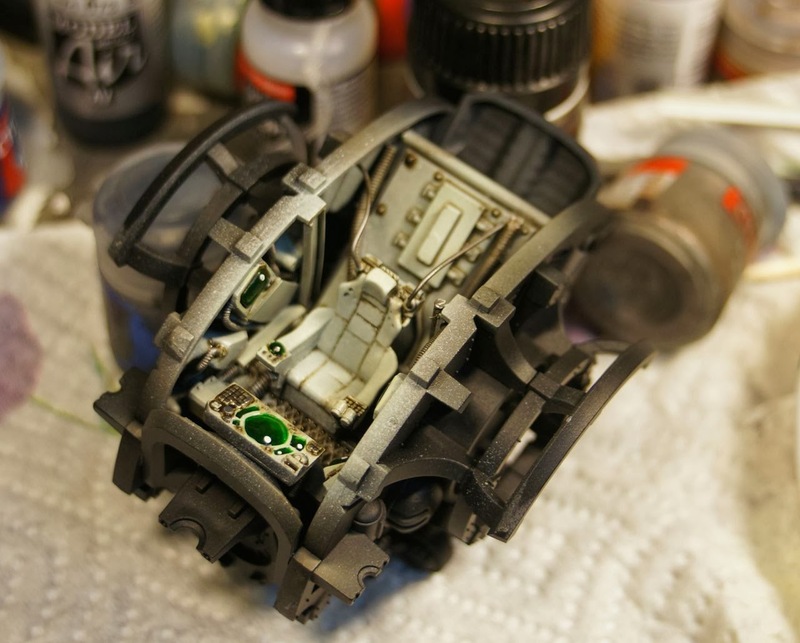 The very first layers of paint are now down on the support structure. 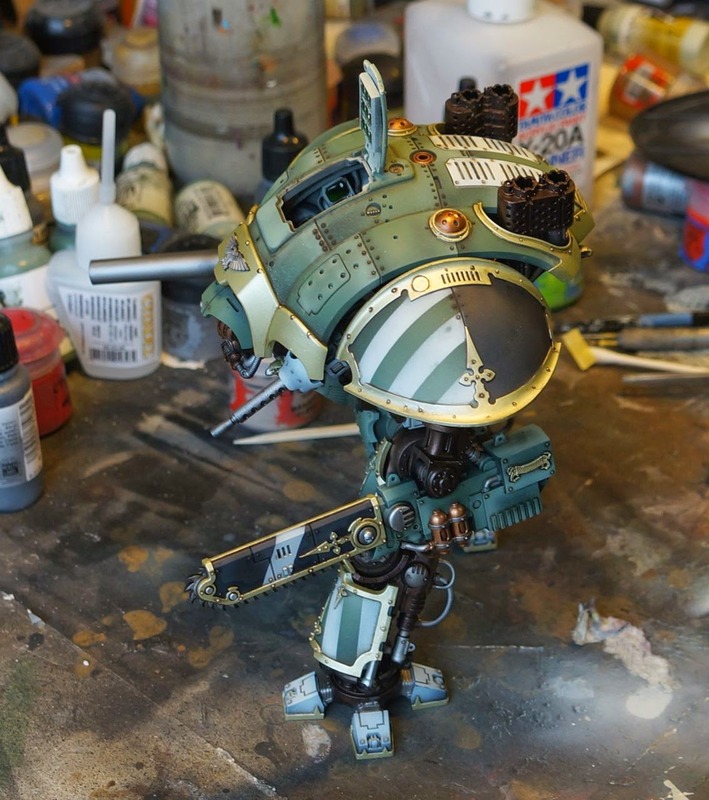 This knight is being kitted up as a knight errant. 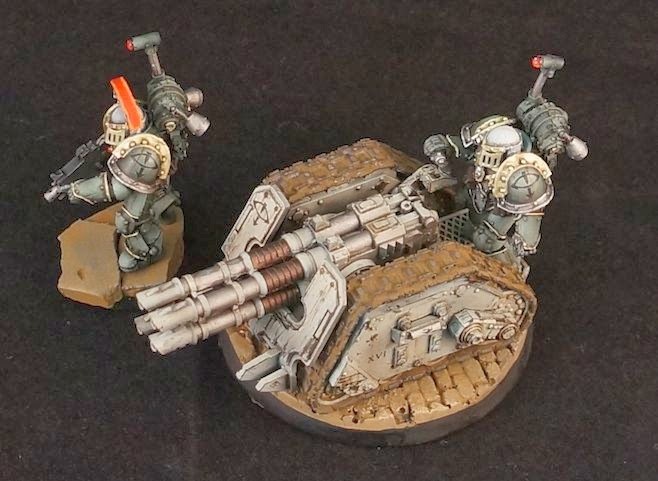 Even so, I had to paint the battle cannon. 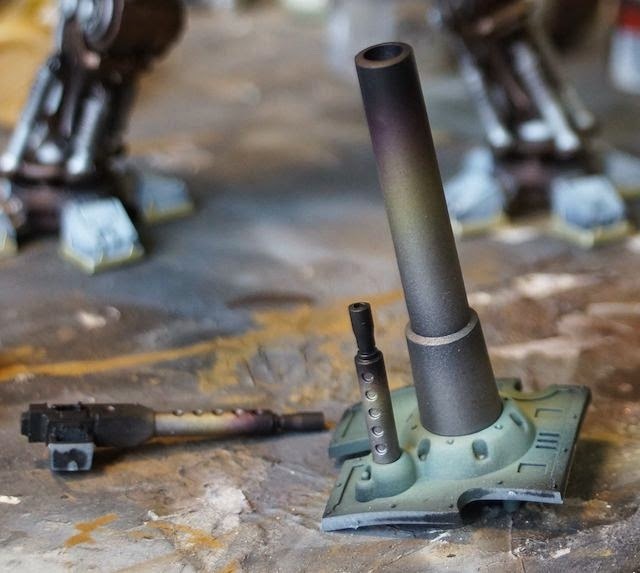 I love painting heat damage and wanted to see what it looked like when I extended it further down the barrel. 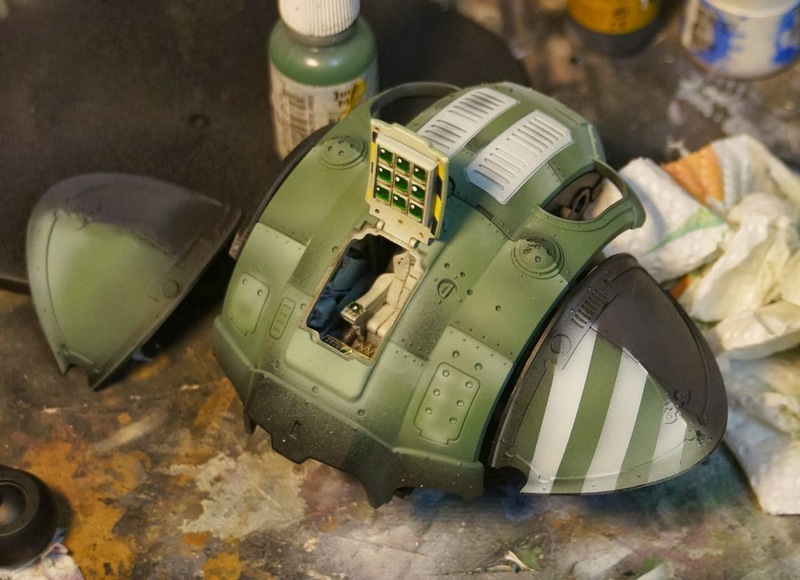 The fun part of the paint job is just starting. 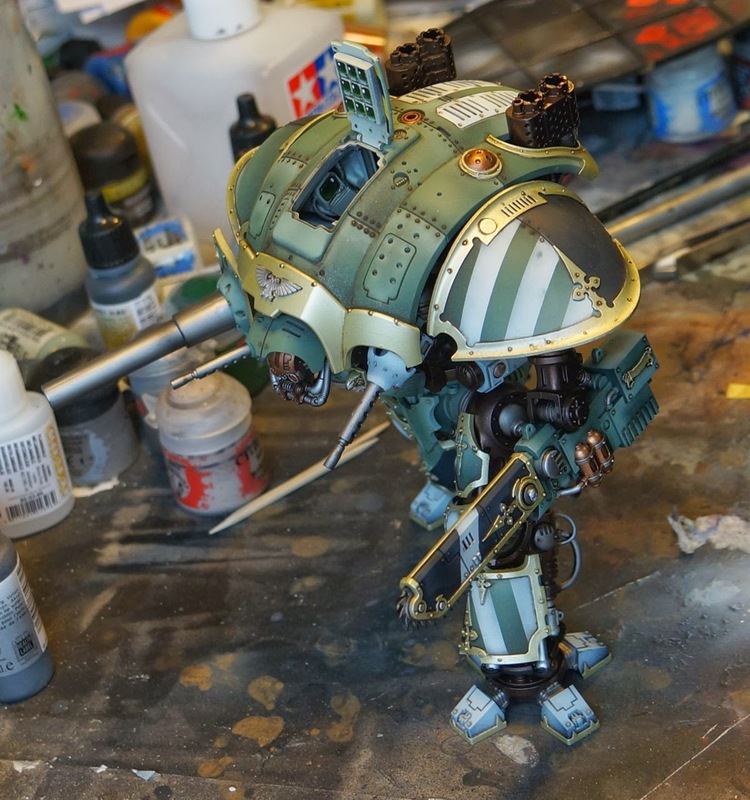 I think this knight will have either chevrons on the middle carapace, or the mid section painted white. The benefit there is that all of the battle damage stands out so nicely, and the grime streaks look better. Shall I flip a coin? 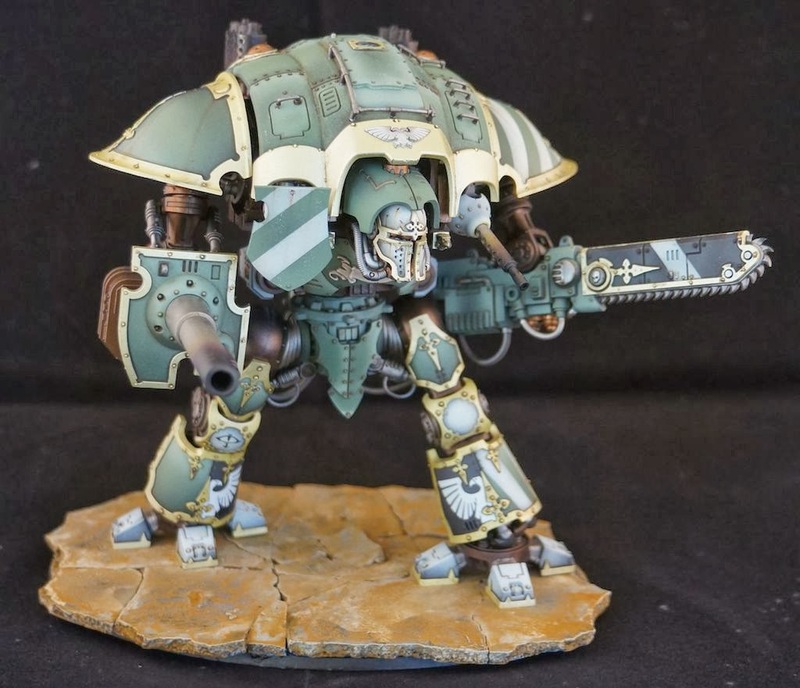 I posted teasers of this guy on the 30k forum, but here he is, the completed Imperial Knight seconded to the Legio Astraman (Morning Stars) supporting the Sons of Horus. 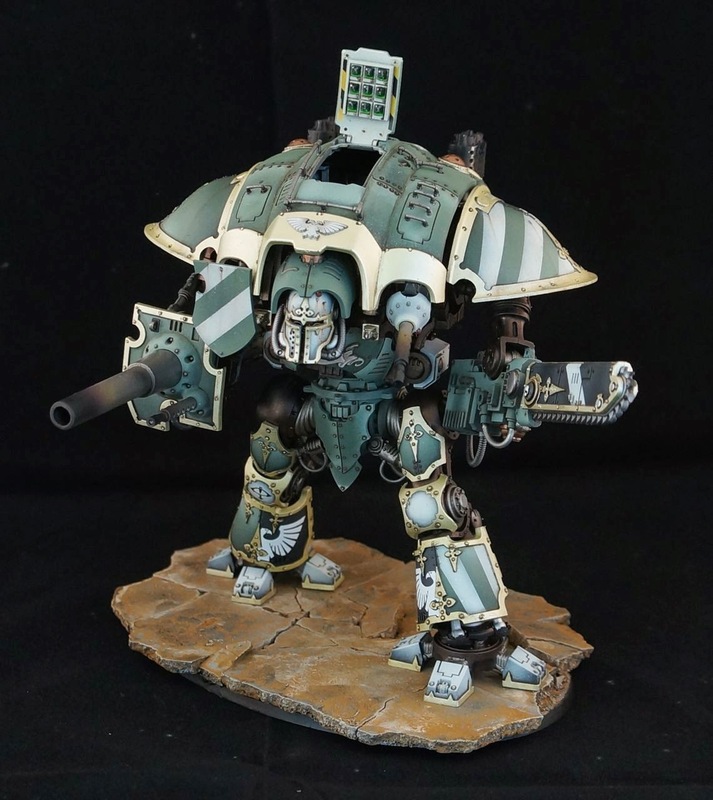 I haven't found good transfers for Legio Astraman, but when I do I will eventually add their symbol somewhere. As far as the original knightly house, that is yet to be determined. 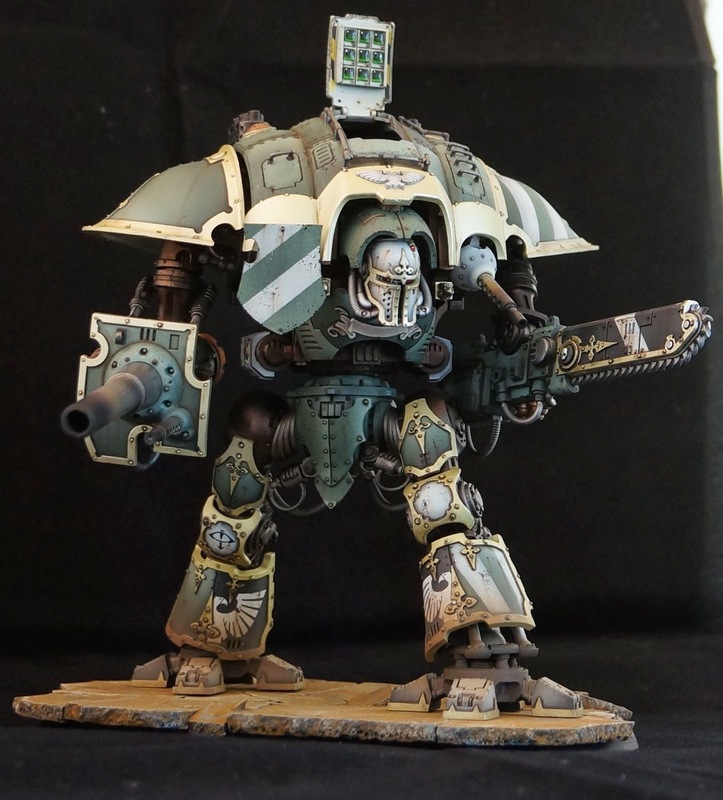 The fact that knights can be oath sworn to Space Marine Legions, or seconded to Titan Legions is simply brilliant. 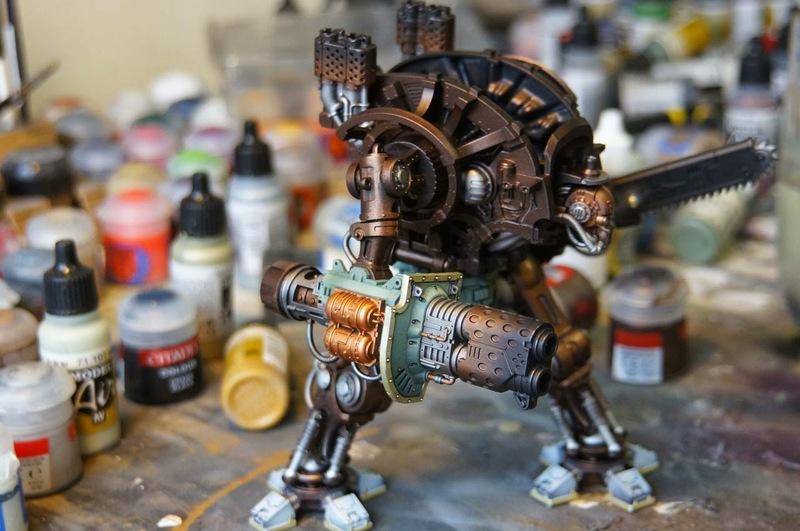 GW put all the hooks necessary for people to get as creative as possible with these units. 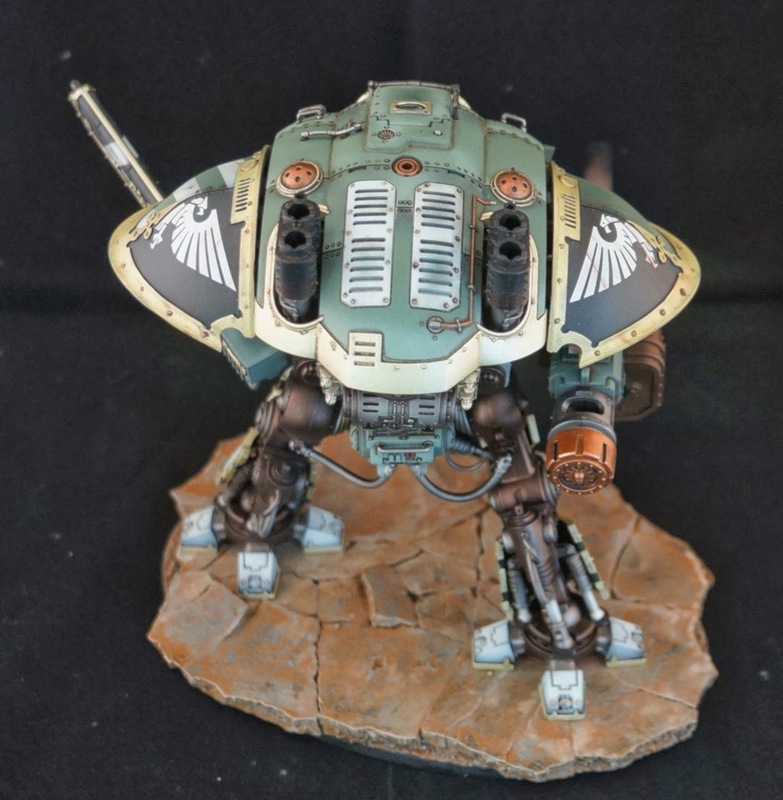 I loved every minute building and painting this model, and have two more on the way. I couldn't resist the chance to do some more carapace designs. 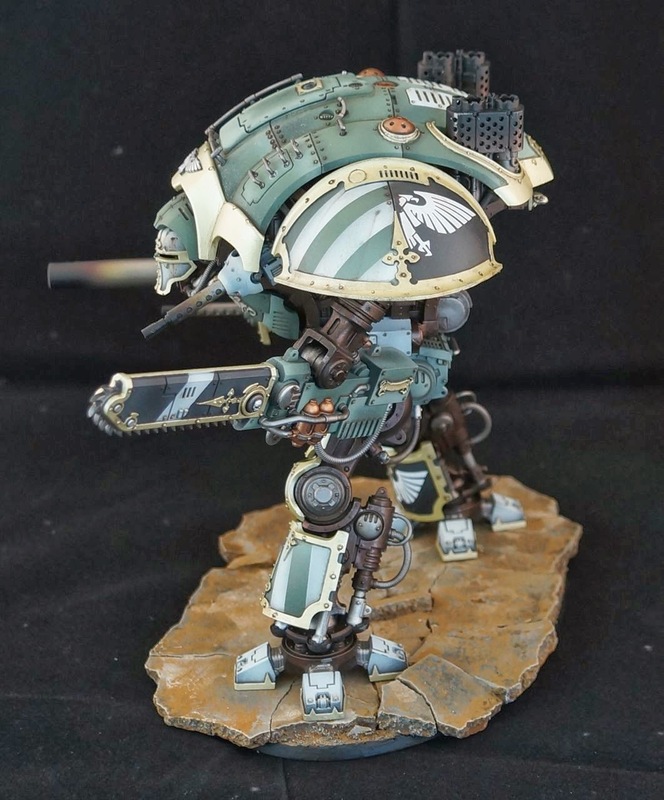 I think white chevrons with black outlines would look good on one of the knights. The other may get white checkers, or have the center segment with the door painted white. 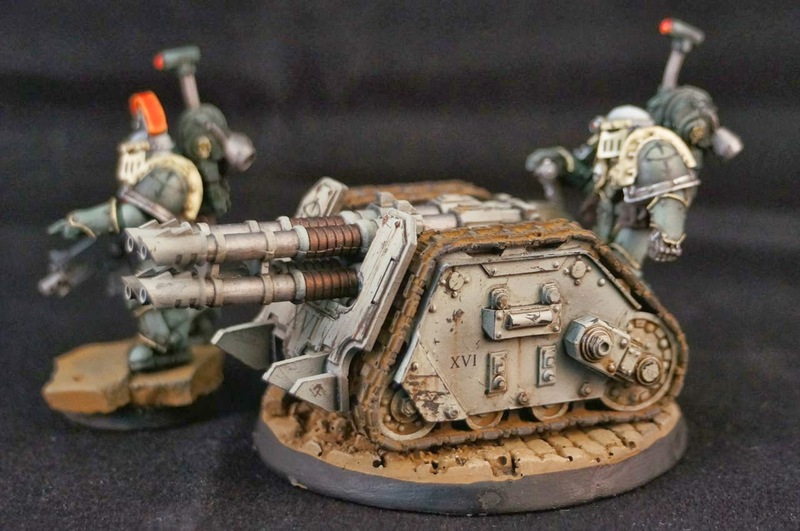 White is such a great base color to add weathering to! 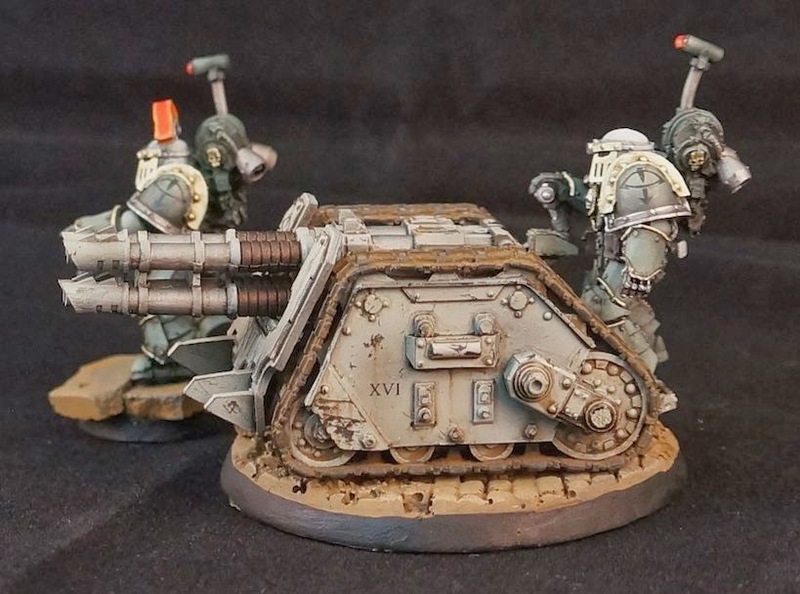 With three of these guys I can use them as a primary detachment. This may even get me back into regular gaming since the force will be really easy to transport. I owned one of the original rapiers from Rouge Trader days, so I had to pick up the new incarnation. 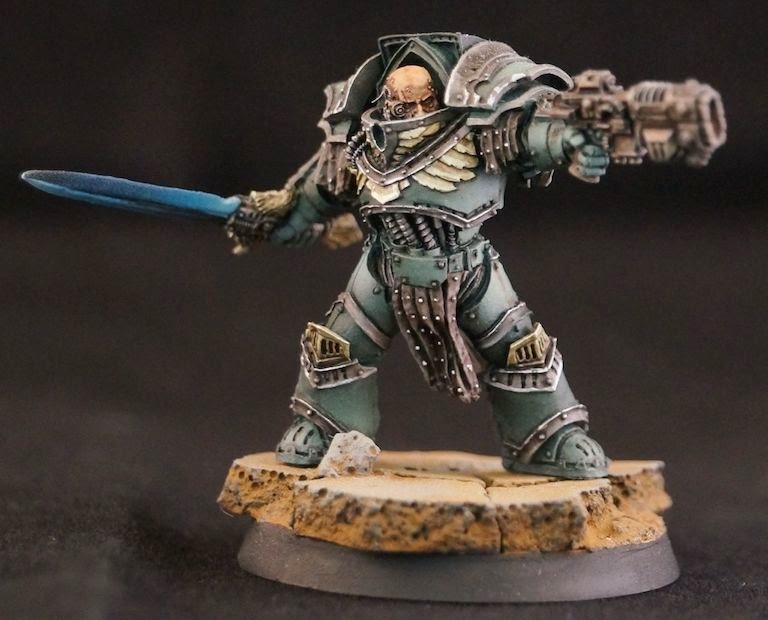 For this model I tried my hand at painting the battery to match the Sons of Horus original colors back when they were Luna Wolves. 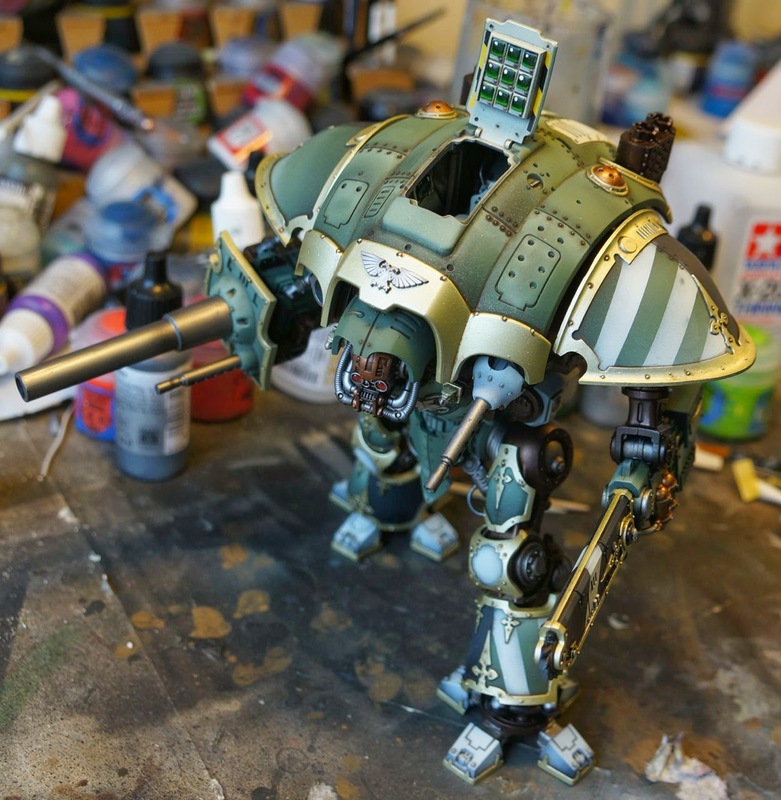 I chipped the paint using a toothpick, and then followed that with oil washes. The models have a lot of damaged detail. 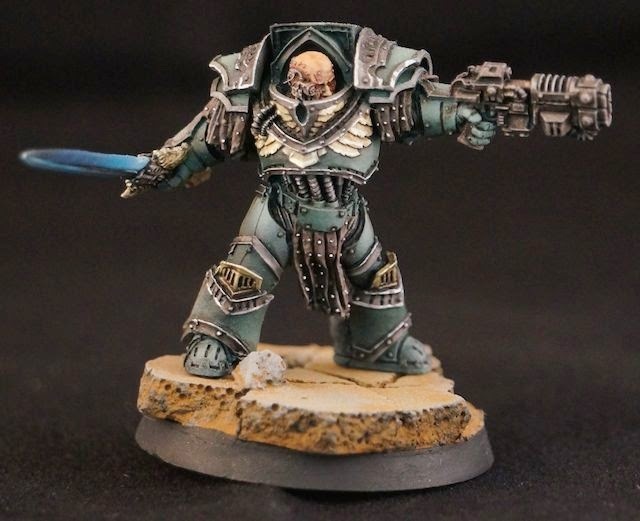 These casts were not very good from FW, but I've had this piece so long returning it was not worth it. A few scratches later and one can hardly tell. 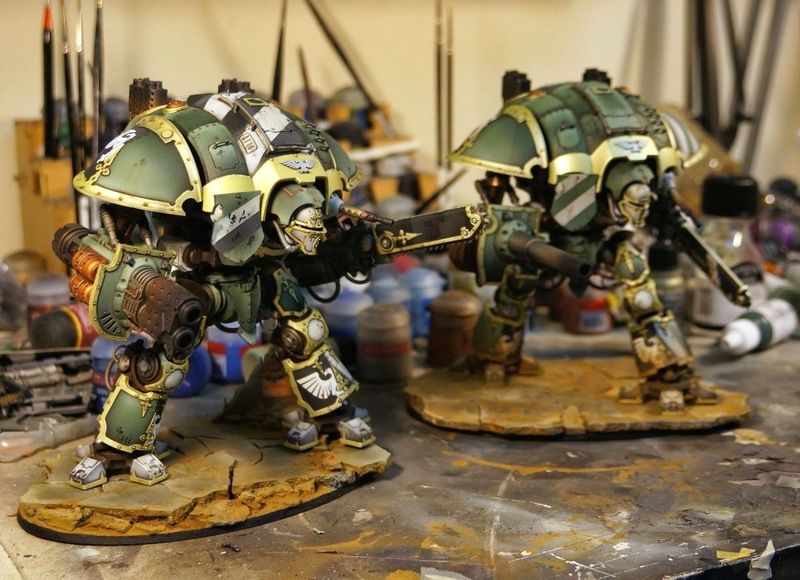 Two more Imperial Knights have arrived at my house, so stay tuned for more of them. 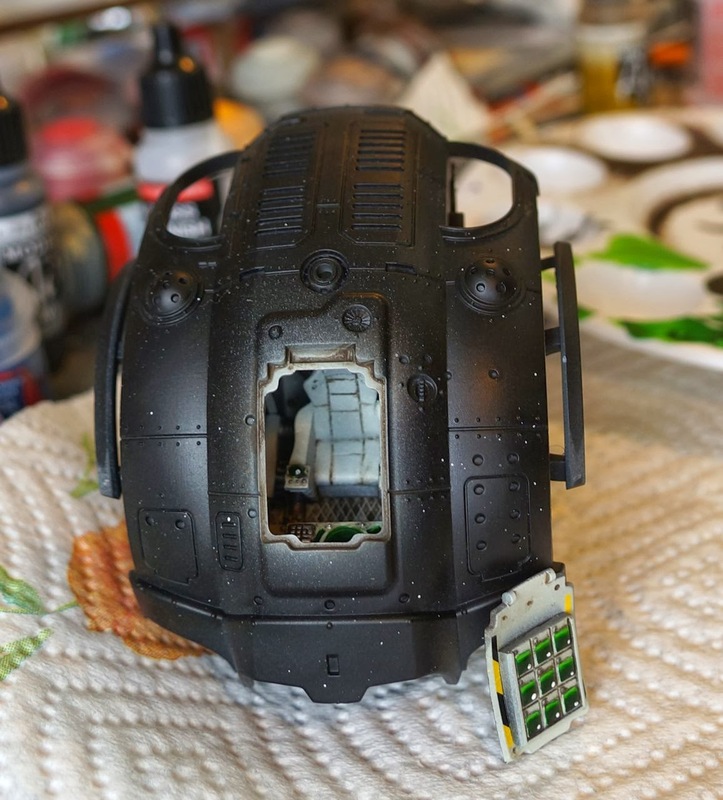 I finally committed to weathering my drop pod today. Sometimes so much work goes into color modulation that it feels horrible covering up all the effort. 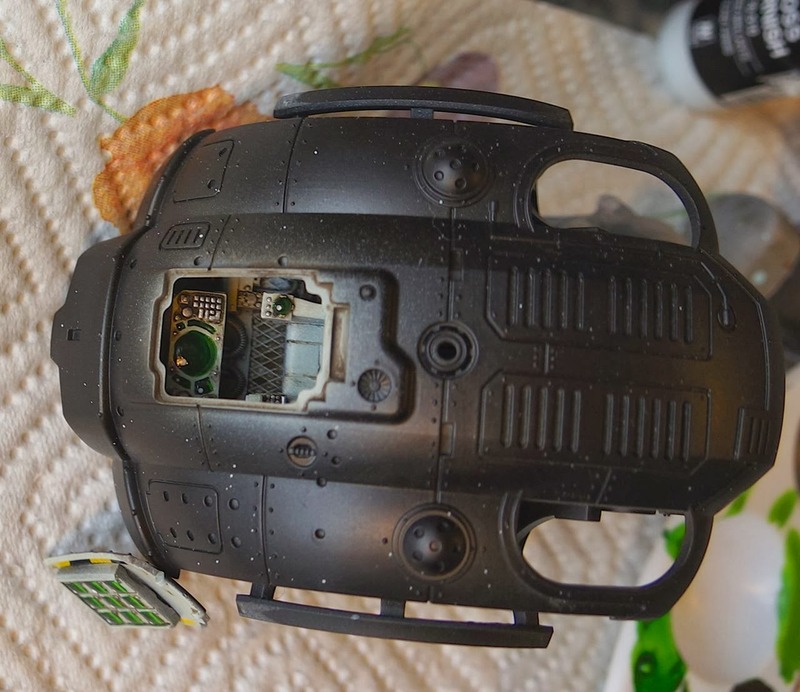 Today I sponged on battle damaged, sprayed dust, and then added soot streaks to the pod. I am on the fence with the results. 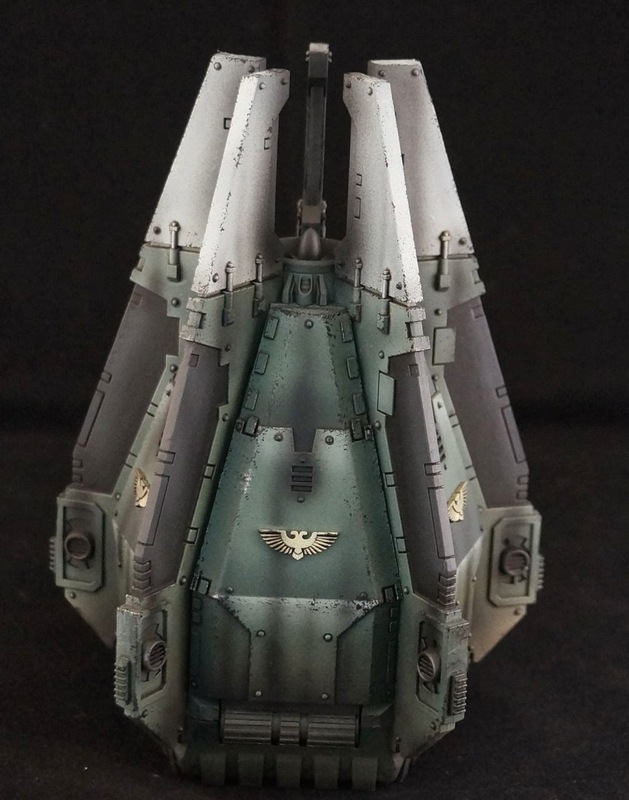 I may switch things up when I complete the storm eagle. 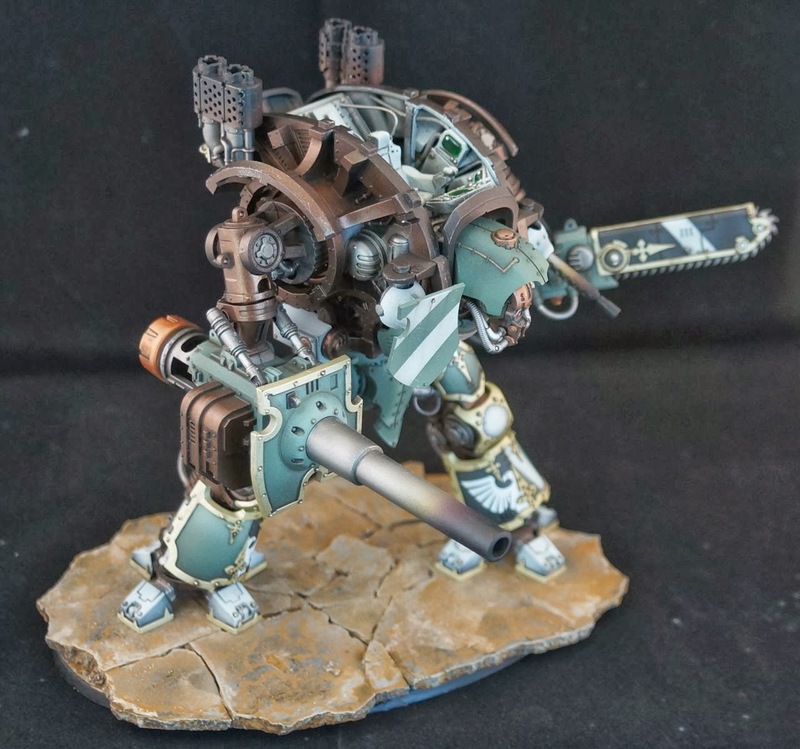 Sometimes a technique works really well on a model ala my Imperial Knight and then just does not translate well to another one. 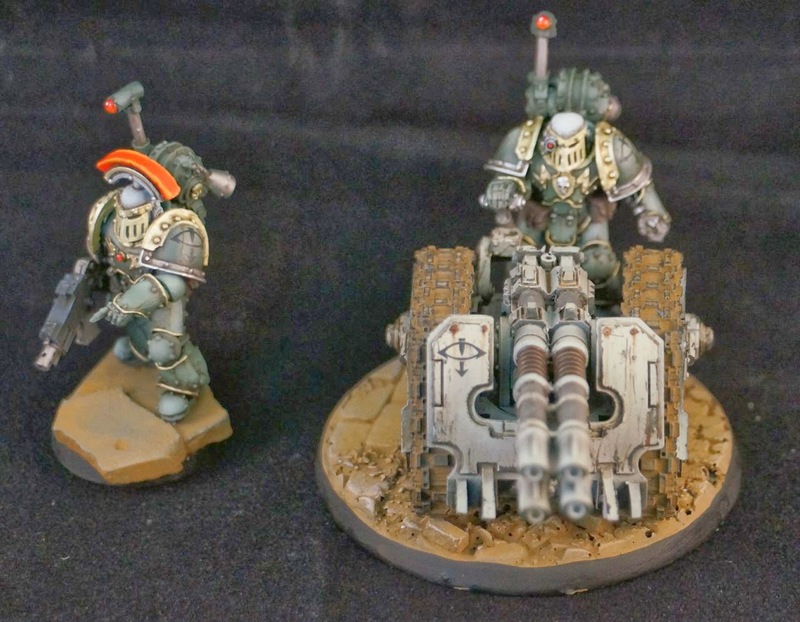 Since the photo booth was out I decided to capture some higher resolution shots of my Legion Praetor as well. I am still getting the hang of using the booth. 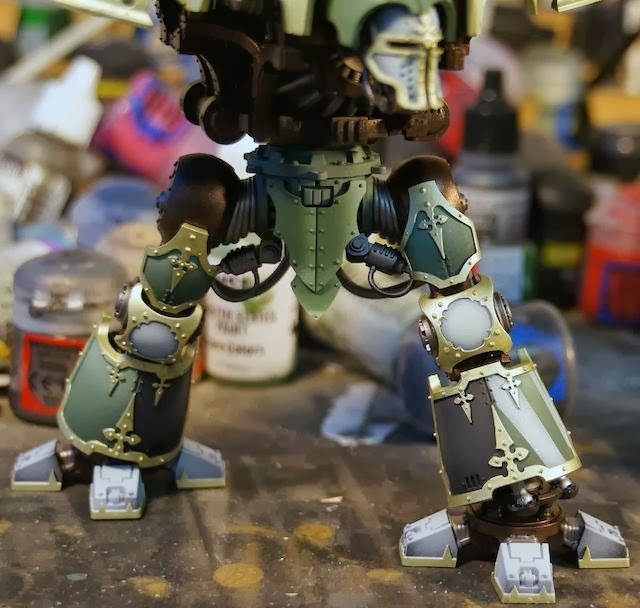 I weathered the faceplate of the knight, but not the rest of it. 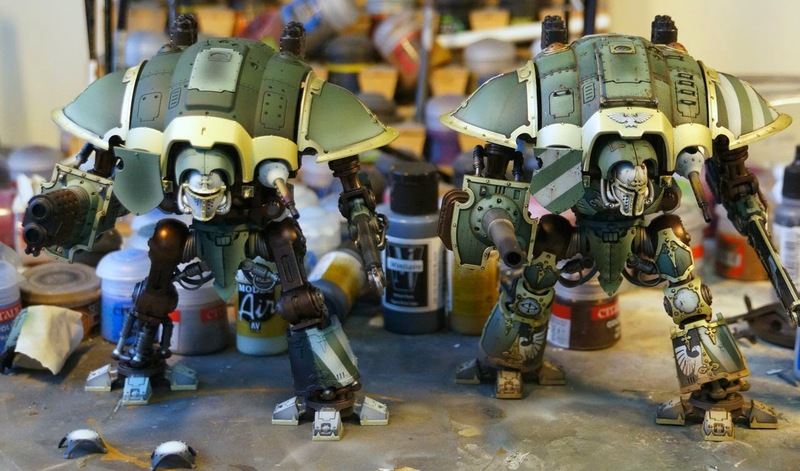 These are the last photos of the knight pre paint chipping, oils, and weathering powders. 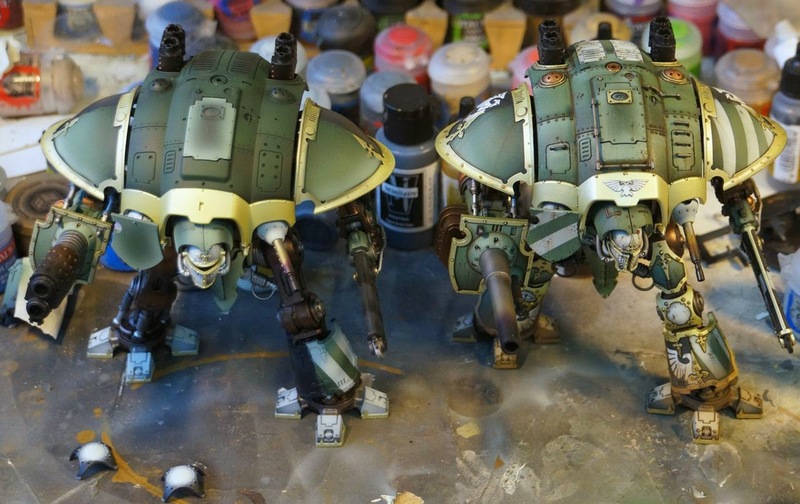 Hopefully all goes well, as two more of this knight's brethren are inbound. 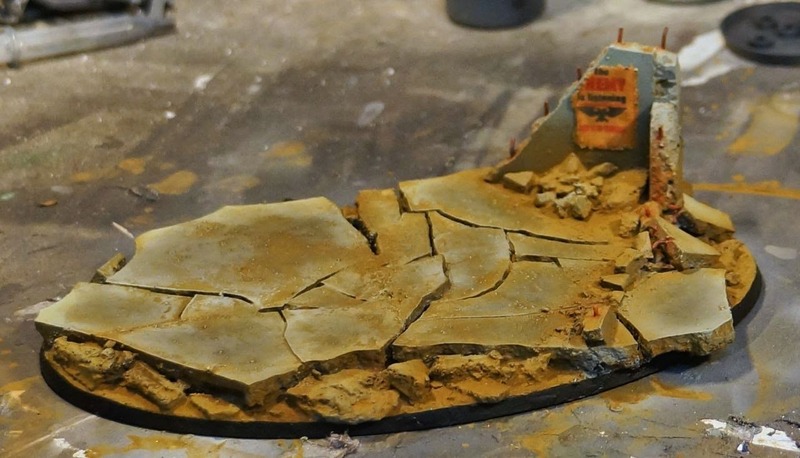 I have not decided how to base the knight, so I decided to cast up some broken concrete as a temporary base. 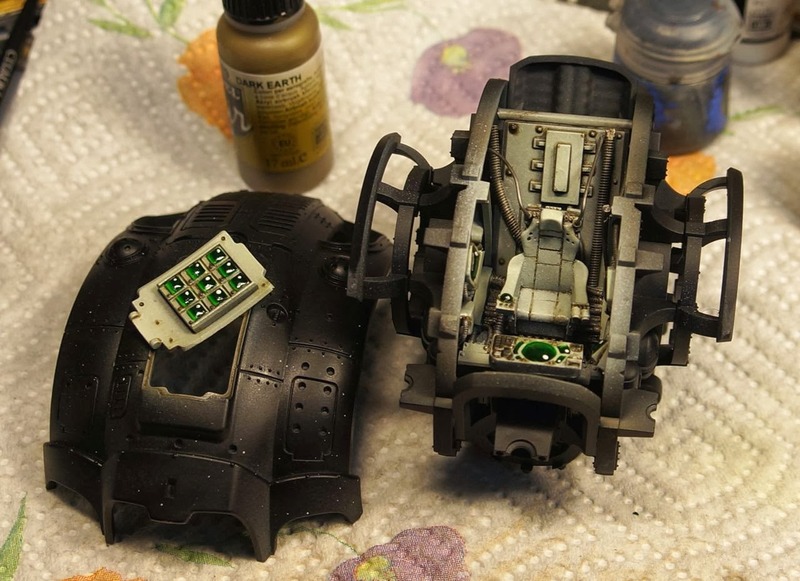 The feet will be weathered to match this. I broke out the photo booth to try and take better photos. 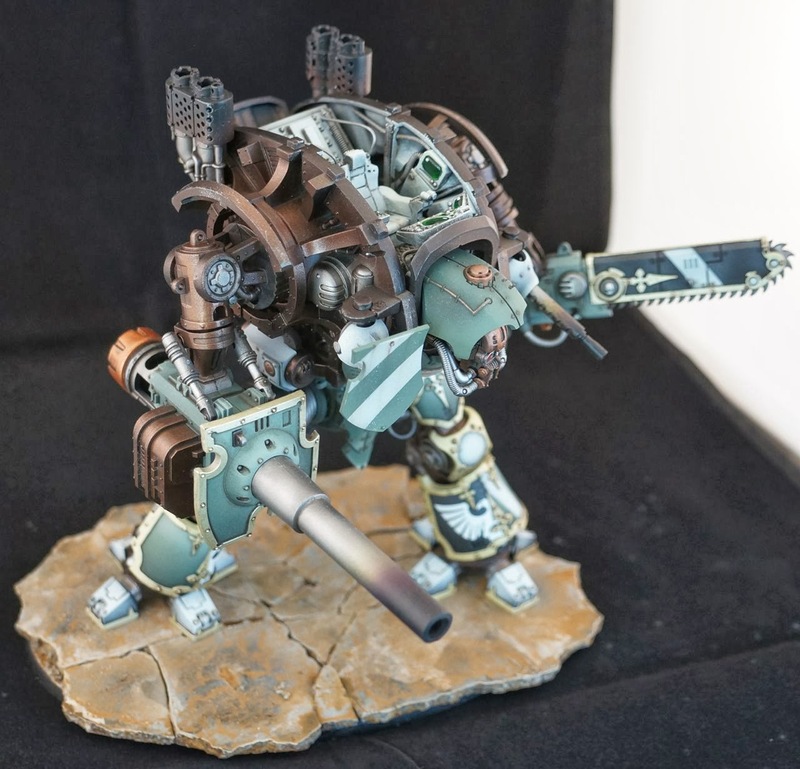 There is still too much light, causing the model to look more washed out than it is in person, but I think I've improved my photography none the less. 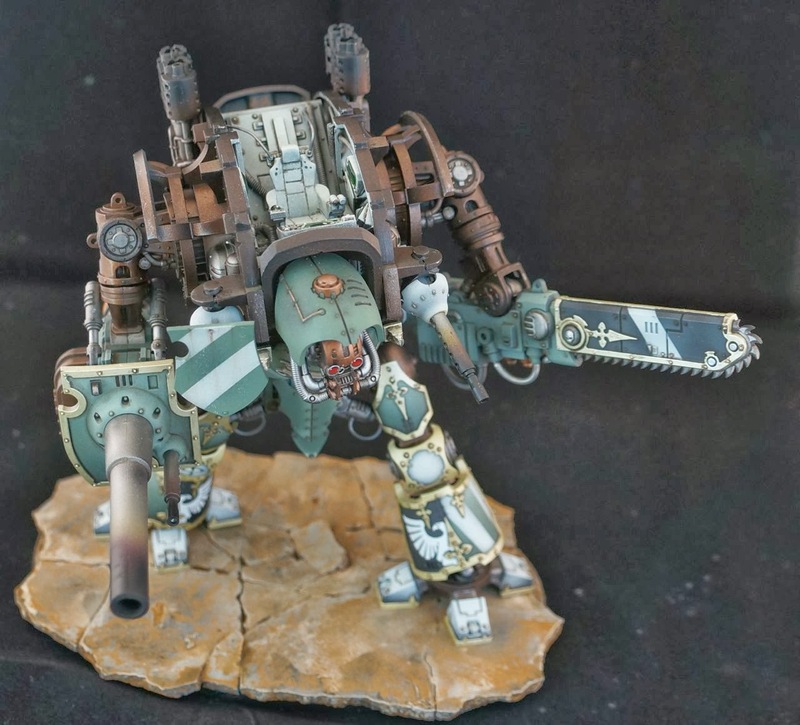 The Knight Titan walks! 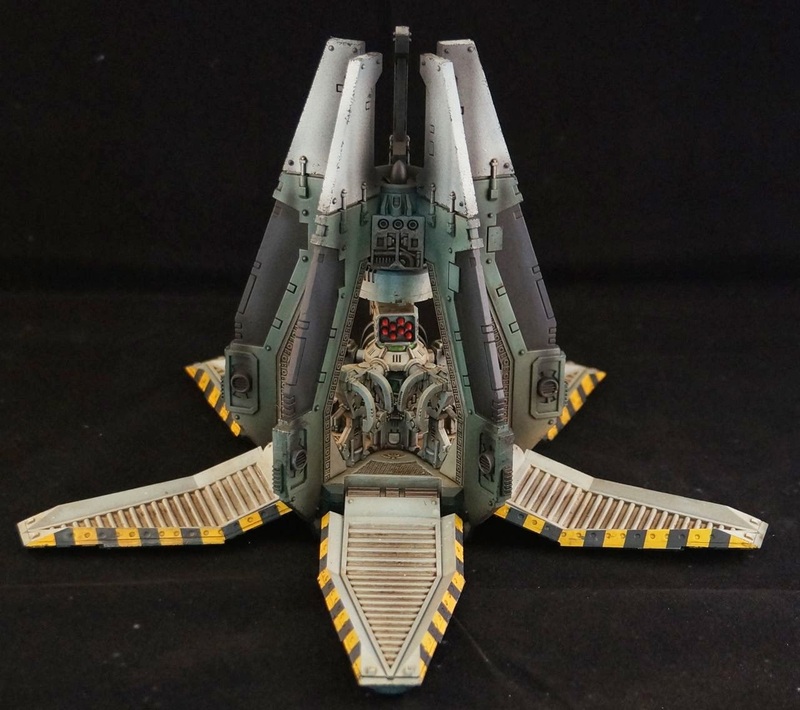 (albeit for a short time since I expect it was destroyed on Istavaan III along with all of the other loyalist forces in the Warmaster's army.) 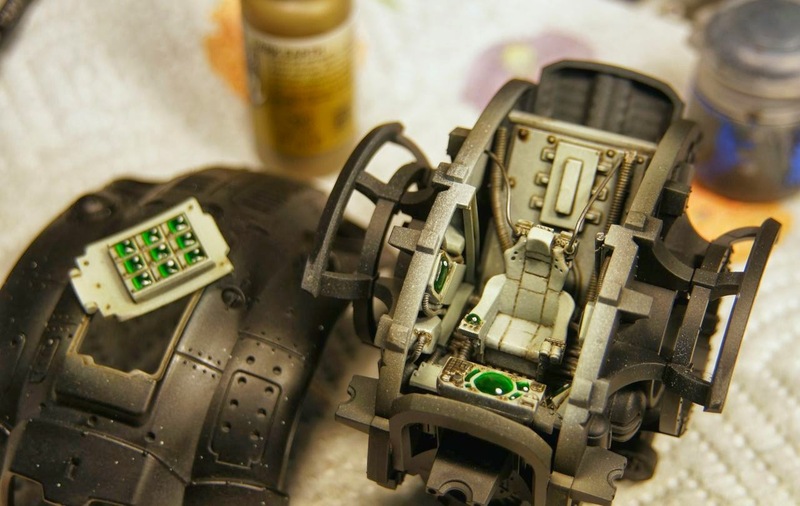 There are so many details to still put on the model, bot in terms of little bits not yet glued, and areas to paint. 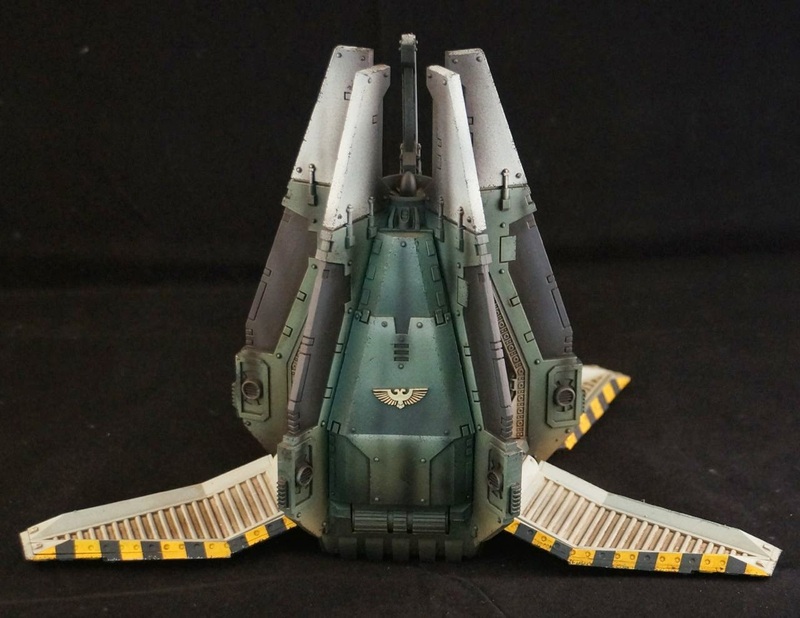 However with so much painted I couldn't resist dry fitting it together and taking some photos. 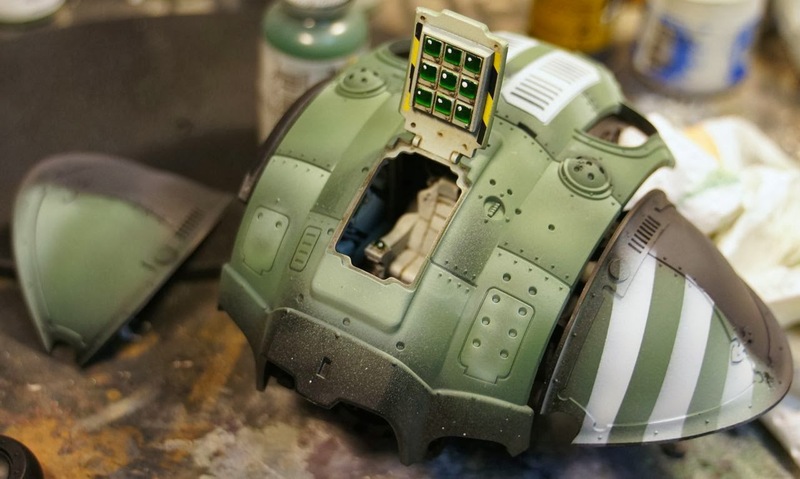 I had intended to have the shield completed, but after painting it green with white stripes I noticed that I had painted them the wrong direction. It looks a little weird on the model. It won't take long to repaint, but it is disappointing. The last thing I need to do is create more work no this model, when I have a load of areas awaiting touchups already. 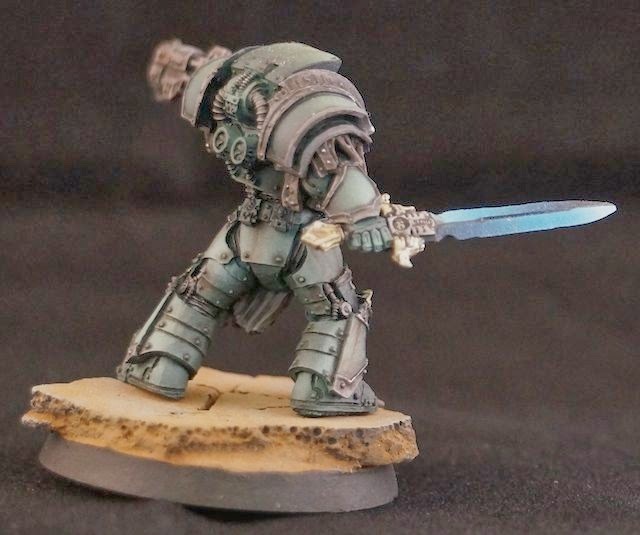 I've said it before, but I can't wait to weather this model. 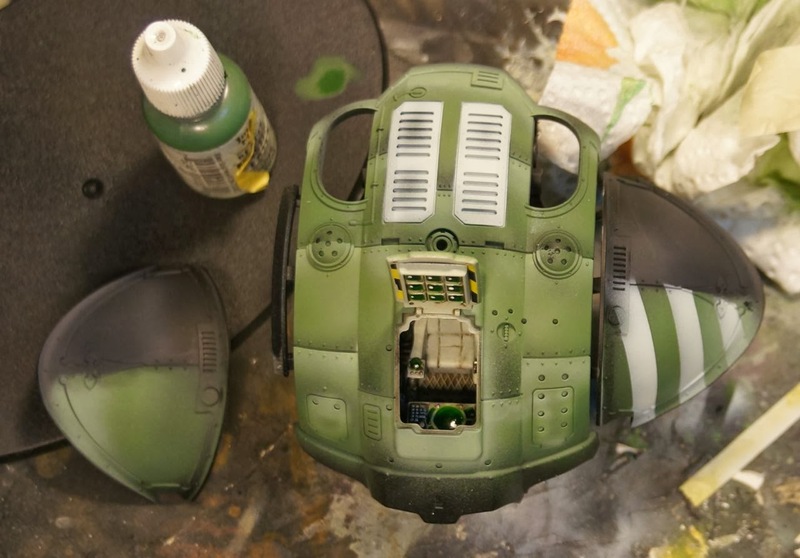 The basic colors are finally done on the torso. 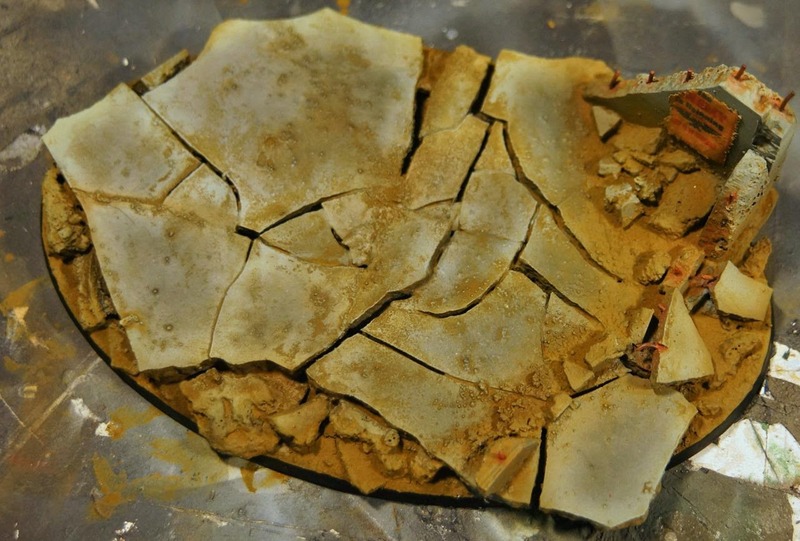 Definitely some caveats here though, since many areas need significant touch ups. 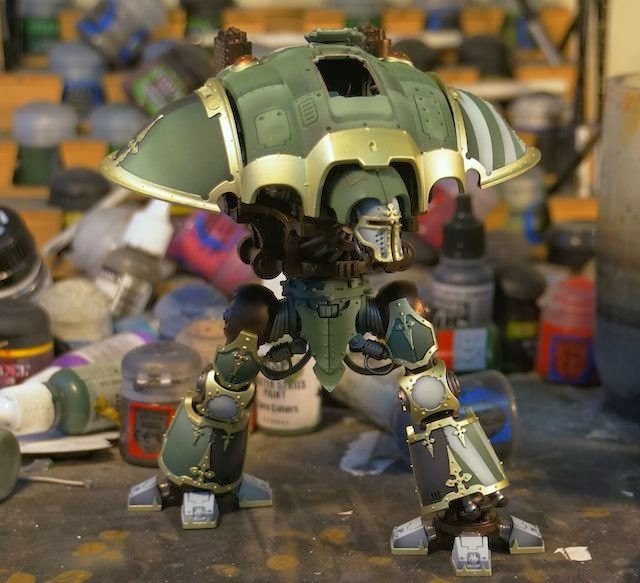 My goal was to get the basics done so I could assemble the model, and then go back and clean up and shade lackluster areas. After that I have transfers to add followed by pin washes. So the big oops is not knowing the orientation of the shoulder pads. 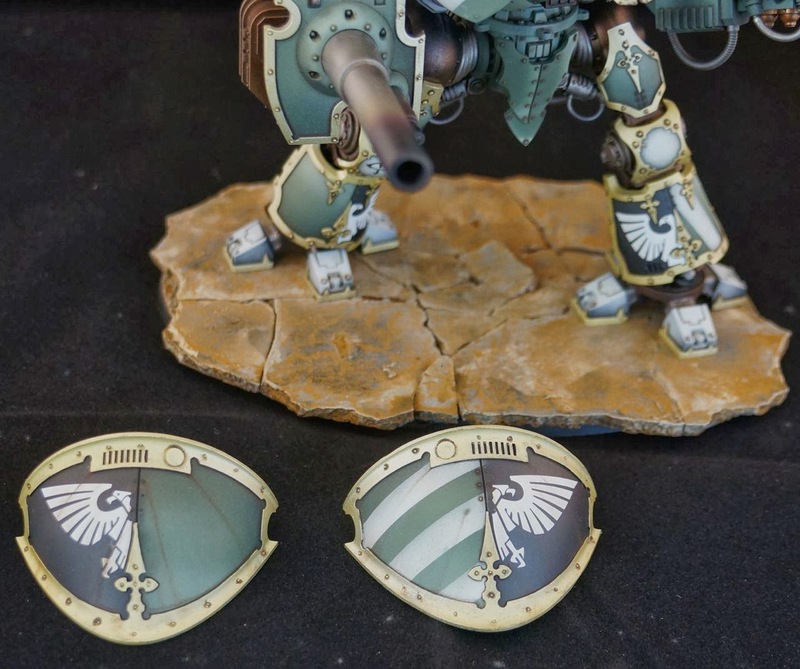 I painted the personal heraldry on the wrong one. Maybe I can justify this as a 30k thing? 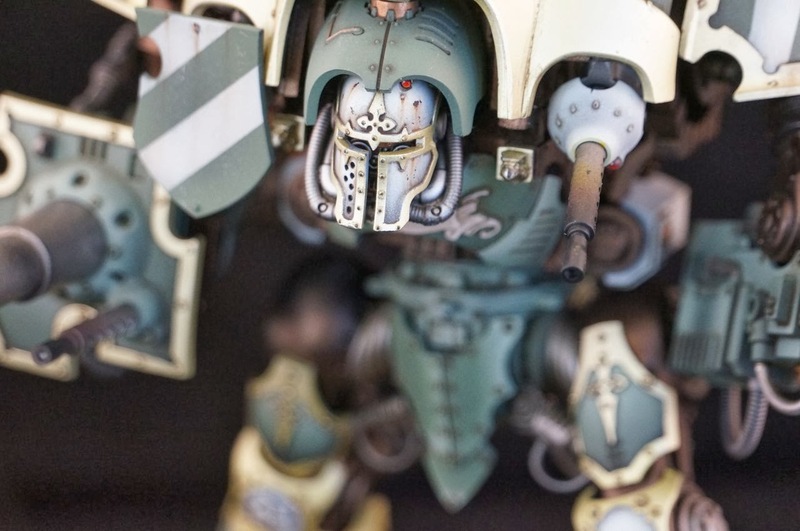 There are going to be Sons of Horus Legion symbol on it proclaiming that this knight swore an oath to the warmaster during the great crusade. 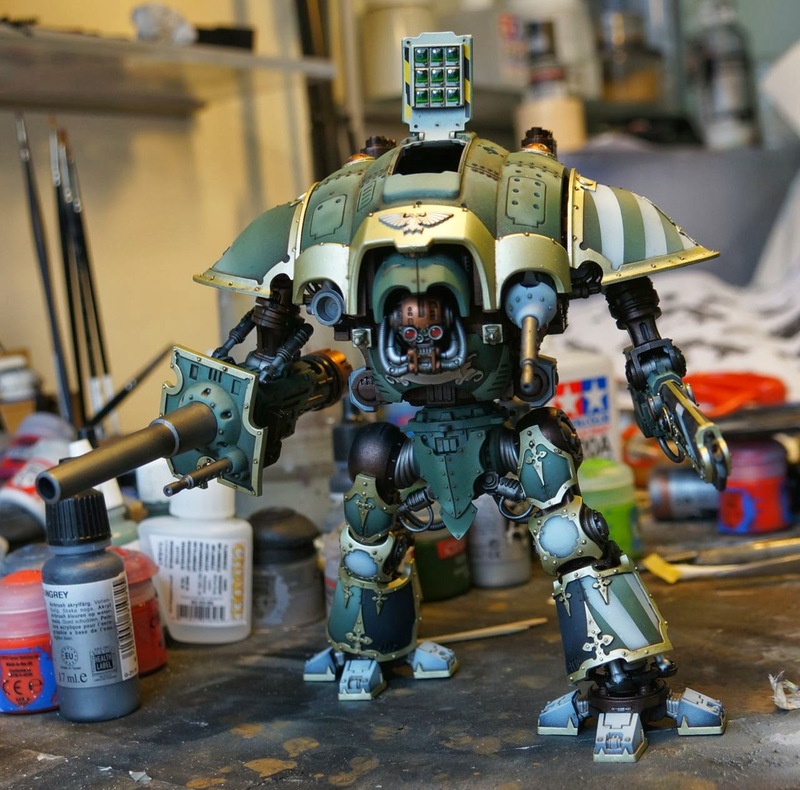 I've added some color to the armor of the Imperial knight. 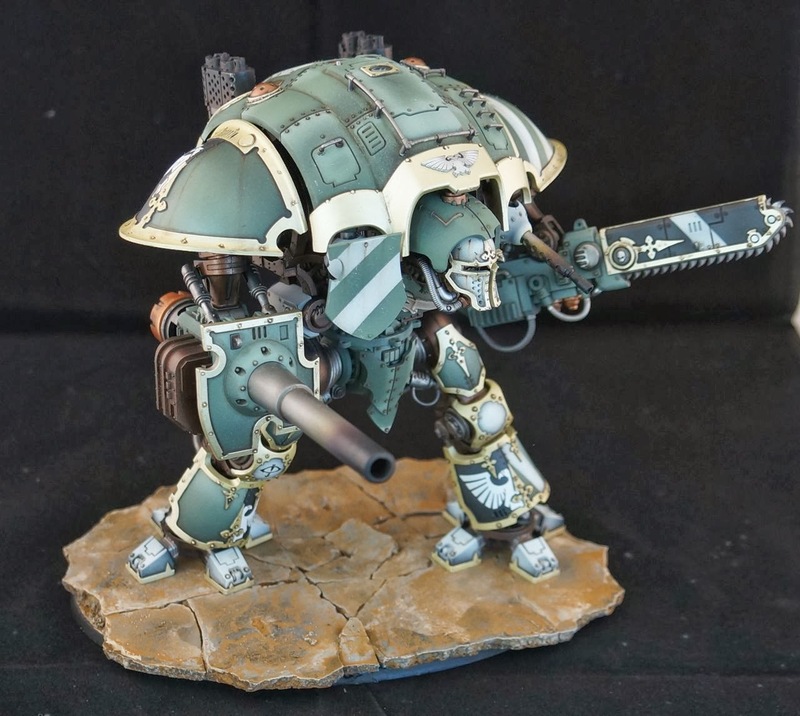 The idea is to tone down the flashy knight colors and go with a scheme that will work well with my Sons of Horus army. 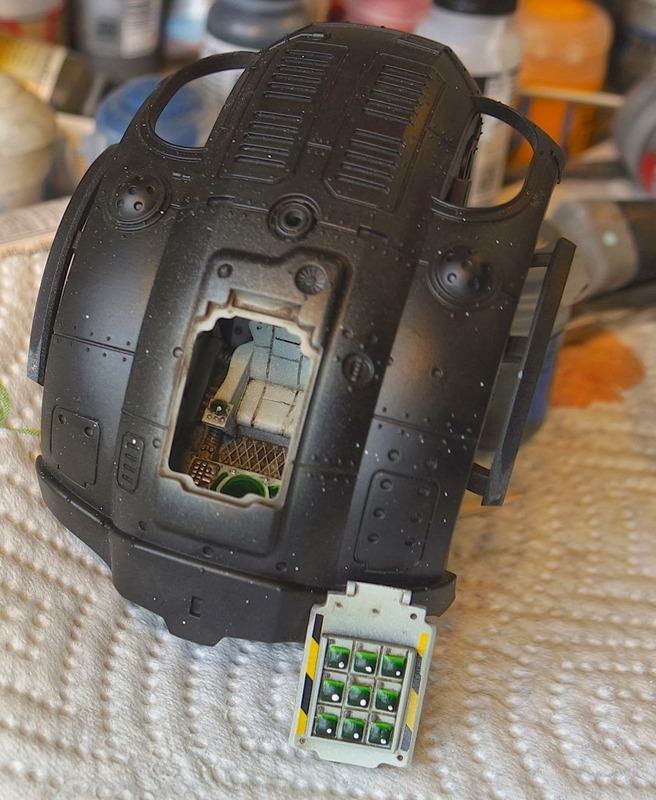 There is a load of work to do, including repainting the view screens, and tightening up the panel lines, but this guy is starting to come together. 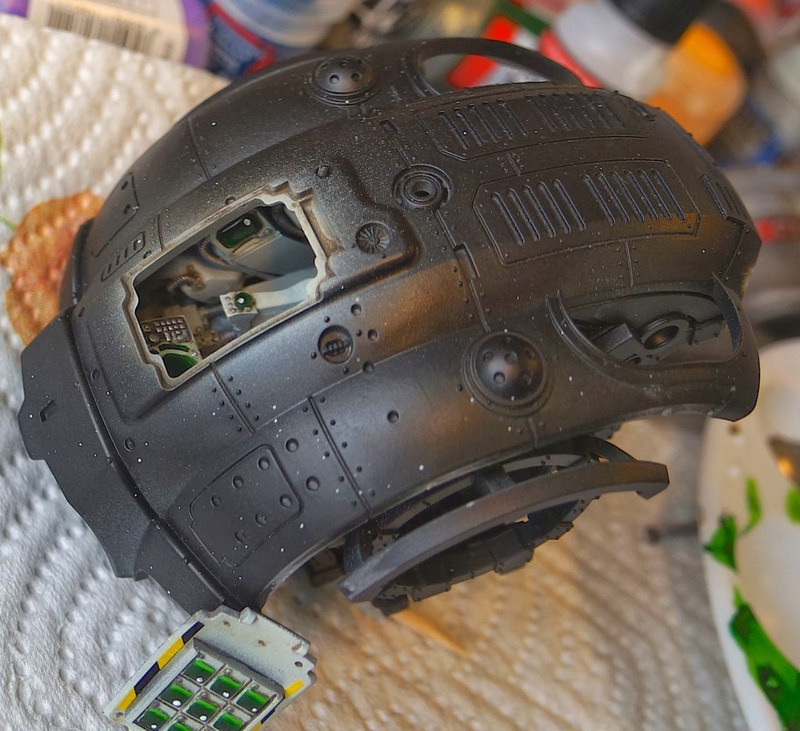 I am really looking forward to adding rust, oil streaks, and grime streaks to it. 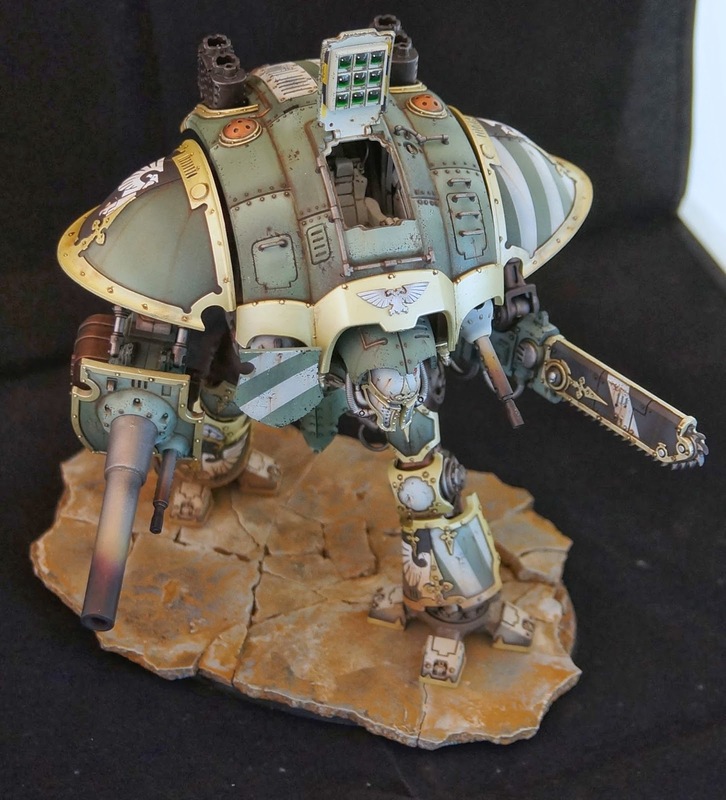 I picked up an Imperial Knight today along with the rest of the GW community. 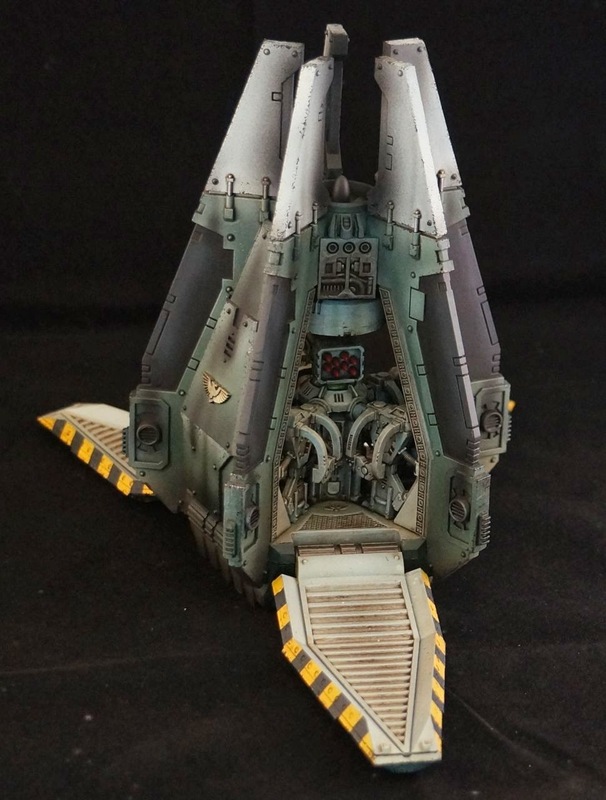 The model is fantastic, but it is missing a cockpit. Since the hatch is removable, It seemed a shame to build it without adding interior detail. So after a quick raid of my bits box, and a few minutes with a dremel, I was ready to go. 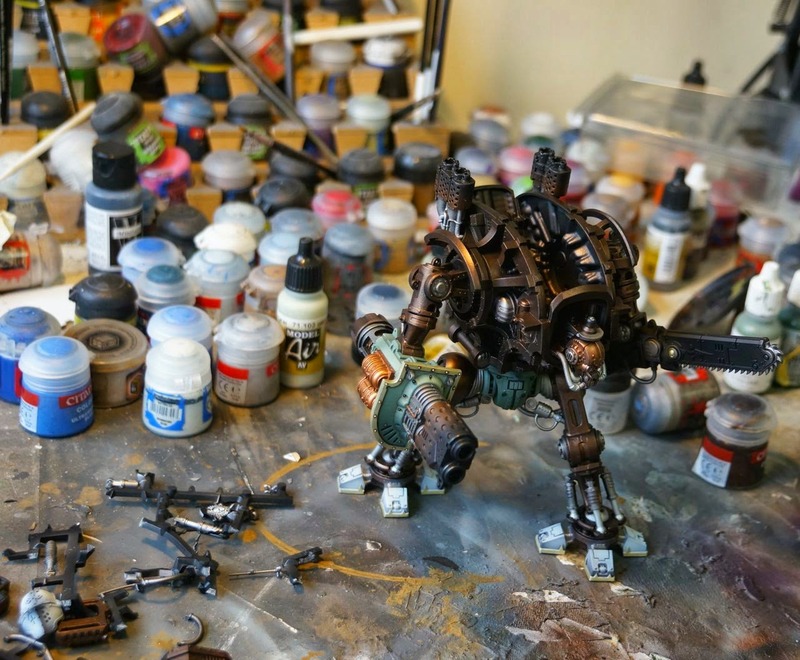 Using my Warhound titan as a reference, I added a command throne, sensors, pipes, hoses, and other random equipment. Not much can be seen through the opening, but it does look cool. *Edit --I added some shots of the interior as seen through the hatch. It is easier to see in person than capture with the camera.